I love Thanksgiving and this post has My Top Ten Healthy Thanksgiving Recipes, plus Ten Honorable Mentions! Not all these recipes are strictly low-carb or gluten-free, but use the links to other round-ups below if you want strictly low-carb and gluten-free Thanksgiving recipes! Check out Thanksgiving Recipes to see more ideas for Thanksgiving on this blog! Click here to PIN My Top Ten Healthy Thanksgiving Recipes! Thanksgiving is approaching quickly, and before we get too far along in the Thanksgiving Recipes I want to remind you about this collection of My Top Ten Healthy Thanksgiving Recipes, plus Ten Honorable Mentions. Even though there are lots of tasty options for Thanksgiving on this blog, these are my absolute favorites, and some of these are recipes I make every year for Thanksgiving. And since this is once-a-year holiday food for me, not every recipe here is low-carb or gluten-free, although quite a few of them are. I promise you will find some very tasty options here, whether you’re keeping it strictly low-carb for Thanksgiving or indulging a bit more for the holiday meal, and just click the link for any recipe and use the tags at the top to see which diet types that recipe is suitable for. But if strictly low-carb and gluten-free is what you’re looking for, check out the list of low-carb Thanksgiving Recipe Round-Ups below for plenty of amazing ideas for holiday foods. Hope those low-carb and gluten-free round-ups are helpful for anyone who’s keeping the menu low in carbs or gluten-free! Now, let’s talk about my healthy Thanksgiving favorites. And if you’ve tried one of these favorites in years gone by, I’d love to hear how you liked it in the comments! Let’s start with 100% Whole Wheat Stuffing muffins. I’ve made these the last few years, and this is something everyone in my family asks for. This Easy Brussels Sprouts Gratin is so good it just might win over some brussels sprouts avoiders! Sweet Potato Gratin with Goat Cheese, Parmesan and Thyme was something we couldn’t stop eating when we tested the recipe, and when I made it for some food blogging friends they loved it too. Low-Sugar (or Sugar-Free) Layered Pumpkin Cheesecake is something I’ve been making for Thanksgiving since 2006, and last year took a better photo to show how good this is! Another recipe I’ve swooned over for a few years is this amazing Low-Carb Brussels Sprouts Salad with Bacon, Almonds, and Parmesan.. If you’ve never tried raw brussels sprouts, they’re really delicious; toss in some dried cranberries if you don’t mind a few more carbs. I can tell when it’s getting close to Thanksgiving by the visits to this recipe for Roasted Green Beans with Mushrooms, Balsamic, and Parmesan; this recipe has been Pinned and viewed on the blog millions and millions of times! 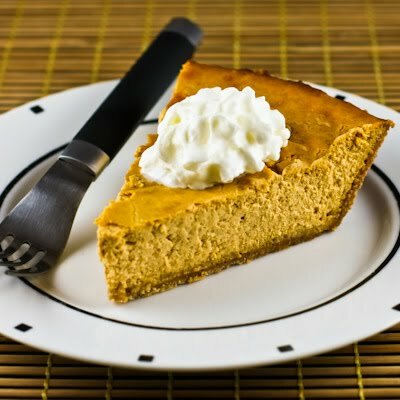 I describe this Low-Sugar Pumpkin Cheesecake Pie as being a cross between cheesecake and pumpkin pie, and I make this every year. 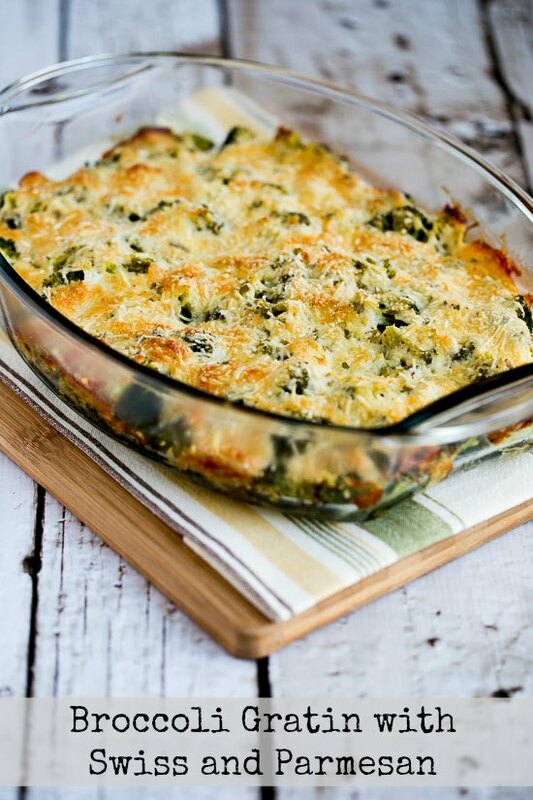 I could never skip this very old recipe for Broccoli Gratin with Swiss and Parmesan without protests from some of my family members, who think this is a must-have vegetable dish for Thanksgiving. Roasted Brussels Sprouts with Balsamic, Parmesan, and Pine Nuts is the first brussels sprouts recipe I made for the blog and I still love this recipe! And finally, another recipe that quickly became a Thanksgiving favorite was these absolutely amazing Sweet Potato Appetizer Bites with Feta and Green Onion. Share Your Favorite Healthy Thanksgiving Recipes? Please share in the comments about what’s going to be on the menu at your house this year, and if you’ve tried any of my Thanksgiving favorites, I’d love to hear about how you liked them! Kalyn, thanks for your great recipes. I see several I would like to make for Thanksgiving, and since we’re having a BIG potluck (30 people) my problem is deciding which ones to make. I often use your recipes and they are my favorites. Thanks again for the wonderful service you provide. I sincerely appreciate it. Suzanne, so kind of you to leave that nice feedback! I am so glad you have been enjoying the recipes! Kirsten, my pleasure and I think doing a round-up of all the round-ups is a brilliant idea. Off to find your post so I can share it! P.S. CONGRATS on 11 Years ! 11 on the 11 that's my favorite number. Auguri !! Thanks, so glad you like it. I love fall foods as well! Bambi, I know just what you mean. In my family everyone still wants the same dishes we had 20 years ago! Good for you for trying some new things; hope you enjoy! I have so many coming from the little gran kids to the 80 year olds and heavens change traditions. Although this I'm adding your Roasted Green Bean & Mushroom dish plus the Green Bean blue cheese salad. Roasted Brussel Sprouts and as a kicker your Cranberry Salsa with Jalapeno's next along with my traditional but certainly labeled. Katerina, come on over! So glad you like the recipes. Happy Thanksgiving to you as well. I don't make or eat desserts all that often either, but there is just something about that pumpkin cheesecake that keeps me interested! Kalyn, I absolutely loved this whole post, but my two favorites are the stuffing in the muffin tin format, and the low sugar pumpkin cheesecake. I rarely make desserts, and my husband doesn't care for cheesecake, BUT something tells me I should not care about either of these "issues' and try that recipe. Becky I am making those stuffing muffins again this year. I was noticing all the good food on the Utah blogs; we should have our own Thanksgiving after party sometime and try each other's food! I love the stuffing muffin cup ideas and all of your side dishes sounds amazing. Between you, Dara and I's blogs today we have a very delicious spread for a Thanksgiving table! Barbara, hope you enjoy the stuffing "muffins." Not many people here (at least where I live) have a big Christmas feast, more likely a nice brunch of just a lunch buffet in the afternoon so it's not so bad. We don't do Thanksgiving here. Thankfully. I cannot imagine cooking and eating a Thanksgiving and a Christmas Feast so close together. I love the green bean recipe.And I'm going to try the stuffing in muffin pans. Great idea Kalyn. Drool, drool!! All looks yummy! Shirley, I love the idea of having a bloggers' Thanksgiving get together! What a job organizing it, but it would sure be fun. Amazing round-up as usual, Kalyn! So many of those appeal to me! As much as I already have on my menu, I wish I could have more. Just have a bite of each thing, you know? One year we need to have a bloggers' Thanksgiving gathering. We could do it several days before or after Thanksiving or maybe mid-way between Thankgiving and Christmas. 😉 That might seem like too much, but we had our Thanksgiving luncheon at work this past week and I don't think anyone will mind having the real Thanksgiving meal–with many of the same dishes–on Thursday. Hi Dave. Glad you like the round-up. I usually don't have time to go back and find photos to submit to eRecipecards, but since I just saved this photo for this the post, just submitted it! They look beautiful, perfect size for a big dinner and just sound delicious! Hint: Would love to see that one added to your recipe file on eRecipecards! Katie, I do agree completely that the side dishes are the best part. Happy Thanksgiving even if you're not officially celebrating. Thanks Pam. I hate winter but I love winter squash! Lydia, you must make the cranberry salsa! I would love to be invited to your house for Thanksgiving! Everything looks fabulous, such a nice spread. Great selection of recipes — I'm reconsidering my menu now and might have to make a swap or two with something from this list. They all look good, especially the squash.